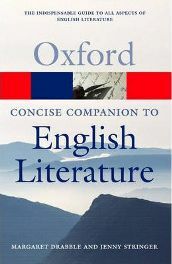 Originally published in 1932, this definitive guide to English Literature edited by Margaret Drabble has been updated on several occasions. The main focus of the alphabetical listing is writers and their major works. Writers of course include authors, playwrights and poets. Shakespeare is afforded two and a half pages, which must be one of the longest entries. (Milton’s is comparable.) Within the entry for any writer, an asterisk next to the title of a work or the name of another writer indicates a separate entry where more detail can be found. So, if you want to read about one particular Shakespeare play, look under its title rather than under Shakespeare. Apart from writers and their works, there are entries for example on the Pre-Raphaelite Brotherhood, war poetry, the literature of food and major characters of works. I have come across the composer Delius and the painter Gainsborough, as well as various pseudonyms. Even theatres are included here, as are libraries, both academic and public. I have used this book with a pupil as young as twelve, who comes to me for one-to-one tuition. He was recently asked to find out what connections certain writers had with the city of Portsmouth. I gave him the ‘Oxford Companion to English Literature’ to look them up in, while I myself browsed through my Biographical Dictionary to see what information it would provide. The ‘Oxford Companion’ definitely provided more details, noting for example that Arthur Conan Doyle qualified as a doctor and practised in Southsea from 1882-90. There is a series of two-page articles on certain literary genres interspersed throughout the book, easily found as they are in alphabetical order. Black British Literature, which is mainly autobiographical, is traced from the late eighteenth century until the present. In the overview of Children’s Literature it probably comes as a surprise that there was no fiction until the mid-eighteenth century. This section takes us up to Narnia and Watership Down and laments the fact that late twentieth century children’s fiction tended to centre around child abuse or drugs. The article on Detective Fiction features Conan Doyle, P.D. James and Ruth Rendell among others. Fantasy Fiction is noted as having become one of the most successful literary genres of the second half of the twentieth century. It is emphasised that Tolkien was not influenced by earlier writers but inspired many followers. Some years later, an element of humour was introduced by Terry Pratchett in his series of Discworld novels. Ghost Stories date back to the Victorian era. Having reached their height in the early twentieth century, they then began to dwindle. Gothic Fiction takes us from Mary Shelley’s ‘Frankenstein’ through Dickens, Faulkner and the Brontes to our contemporary Stephen King. Historical Fiction was highly respected in Victorian times, and although the popularity of prolific Barbara Cartland is recognised in the twentieth century, Eleanor Hibbert is noted as being a superior authoress in this genre. The article on Metre – the pattern formed in poetry by the sequence of syllables – could be extremely helpful for students of A level English literature grappling with iambic pentameter or dactylic tetrameter. Other reference works on the subject are cited here too. Modernism is traced from the late nineteenth century to the start of the Second World War. It was an umbrella for a variety of movements where French writers exerted considerable influence. Virginia Woolf, James Joyce, and D.H. Lawrence are mentioned among the most prominent modernist exponents, as is the poet W.B. Yeats. Post-Colonial Literature deals with issues such as identity, ethnicity and gender, as for example in Joseph Conrad’s novella ‘Heart of Darkness’. Within this genre, it is noted that the Nigerian author Chinua Achebe used the English language to reach a wider audience. The overview of Romantic Fiction, in particular the Romantic Period from 1780-1848, could again give an insight to A-Level students studying the poetry of William Blake or William Wordsworth. Science Fiction has captured the imagination of readers and film-goers through the concept of travel through time and space or the ability to overcome death. H.G. Wells’ ‘The Time Machine’ published in 1895 perhaps set this movement in motion. The genre continued throughout the twentieth century, when authors such as Orwell and Huxley based novels on the way in which they imagined society might be run in the future. Spy Fiction became popular on a large scale during the twentieth century, with Ian Fleming dominating the post-war era. Both John Le Carre and Frederick Forsyth carried this genre through to the end of the century. The final two-page overview deals with Structuralism and Post Structuralism. Following the alphabetical listing, Appendix 1 is a chronology dating from the year 1000, with principal literary works in the left-hand column and other major events in the right-hand column. This again would be valuable to A-Level students who have to discuss literary works in a historical context. Appendix 2 lists Poets Laureate from the seventeenth century to the present day. Appendix 3 deals with literary awards, notably the Nobel Prize for Literature but also the Library Association Carnegue Medallists and the Booker-McConnell Prize for Fiction. This is a book that is not only a useful resource for students. Anyone with a love of literature could dip into this book from time to time and find something of interest, and even if you have just forgotten who wrote a particular novel, play or poem you will find the answer here. It is easy to see things in context, to know who was influenced by whom or influenced whom. This is a hefty tome, with 1172 pages. The list price is £29.99, but it is worth looking around for a lower offer. No Comments on "The Oxford Companion to English Literature"